I have two large parties a year. In October I have my Halloween celebration. As my birthday is July 25th, I invite my siblings, their kids, cousins, and my old 90 year old aunt for a midsummer part. This year was no exception. When making food for 15 people in a tiny kitchen, I always prepare cold food, and this year I made some classics I have made before. 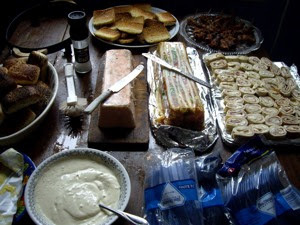 I made a tapas table - a Nordic-Mediterranean fusion meal. 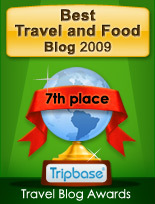 I have a recipe on salmon and tuna mousse here on Enjoy Food & Travel. There I recommend that you use gelatin powder or sheets. I made the mousse the same way. I used packets of aspic (stock and gelatin powder) that you can get in most Norwegian supermarkets and used 1 kilo / a little over 2 lbs of salmon. I poached the salmon in 50 cl / 18 fluid oz of milk. Added 1 tsp sweet chili and herbs (lemon balm and lemon thyme). Removed the salmon an allowed to cool. oblong container adding the rest of the salmon. 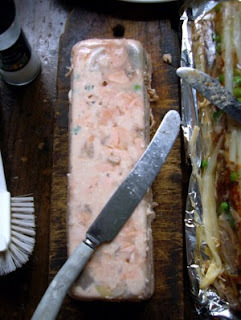 Allow the salmon mousse to set in the refrigerator over night. Remove from container on to a tray. Use another packet of aspic. Heat 50 cl / 18 fluid oz. of water and add the aspic powder. Then you need approximately 800 grams / 2 lbs of chicken meat. I bought a cold roast chicken and plucked the meat off. 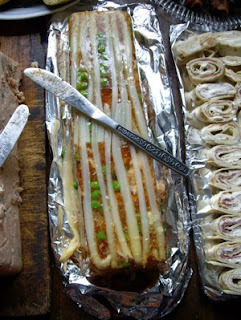 Arrange white asparagus (I used canned), green peas (frozen are great), and the meat in layers in a oblong container. Pour aspic over. Allow to cool in refrigerator over night. Remove from container on to a tray. Pour 20 cl / 7 fluid oz good olive oil in a casserole. add 4-5 anchovies fillets, 2 tsp minced garlic and herbs in you have in hand. I used lemon thyme, thyme, oregano, tarragon, and rocket leaves. Heat the oil carefully, it should only infuse, to enhance the flavour from the anchovies, garlic, and herbs. Remove from heat after 10-15 minutes. 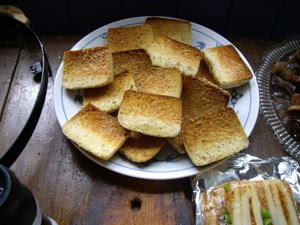 Cut rolls or ciabattas into halves, dip the surface into the oil, place them on a baking tray. Sprinkle a liberal amount of grated parmeggiano on top, and bake in a hot oven until golden and crisp. 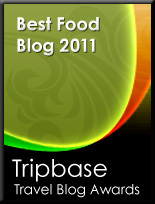 Great for soups or salads. Waste not - want not. As I have much of the delicious infused oil left after the bruscetta, I decided to prepare some seafood. I used 500 grams / a little over 1 lb of frozen seafood mix. 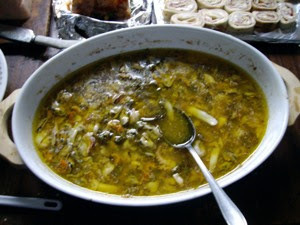 This mix contained calamaris, prawns, and mussels. Defrost the seafood. Pour the leftover olive oil and one glass of good, dry white wine (I used a table wine from Languedoc) in a ovenproof dish. Add the infused olive oil. Place in a hot olive oil, and allow to remain in the oven 10 minutes after you see the liquid bubble. Great to dip the bred in the liquid. 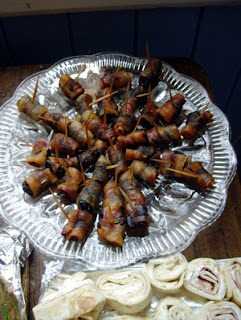 I served my little piggies, prunes rolled in bacon. Then I made salmon nibbles with cream cheese. I am happy to say that the party was a success. I started the preparation of the food the day before and in this way, making food for 15 an easy task. As long as you have a large refrigerator you can prepare the aspic, salmon mousse and the piggies and store them over night. You only need to prepare the seafood, salmon nibbles and the bruschetta the same day.